In order to immediately point out the importance of his New York trial, Mexican drug kingpin Joaquín Guzmán, ‘El Chapo’ immediately accused two Mexican presidents of involvement with his Sinaloa cartel. Talk about a remarkable entry for the first day of his long-awaited court case. 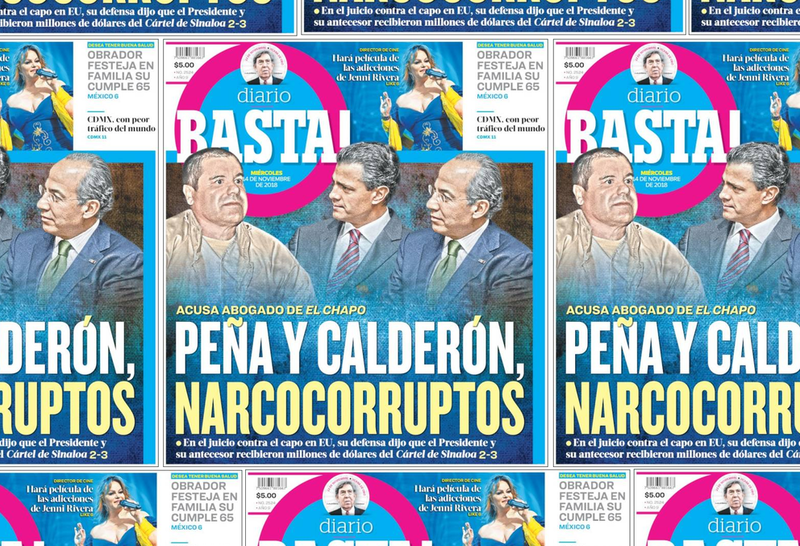 In response, Mexican president Enrique Peña Nieto and his predecessor Felipe Calderón have both denied that they were bribed by the powerful Sinaloa cartel. One of the lawyers for Joaquín Guzmán, 'El Chapo', had accused them of this at the start of the trial against the New York drug lord. "The government of Enrique Peña Nieto has prosecuted, arrested and expelled criminal Joaquín Guzmán Loera. The statements of his lawyer are completely false and defamatory," Eduardo Sanchez, spokesman for the Mexican president, responded via Twitter. The Mexican former president Felipe Calderón also responded via social media, stating "neither he, the Sinaloa cartel, or any other cartel have paid me money," he wrote. Related coverage: <a href="https://thegoldwater.com/news/41374-NY-Mexican-Drug-Kingpin-El-Chapo-Trial-Starts-Video"> NY - Mexican Drug Kingpin “El Chapo” Trial Starts (Video)</a>. According to the lawyer, hundreds of millions of dollars were transferred, on behalf of the organization, to Presidents Peña Nieto and Calderón. Ismael "El Mayo" Zambada, the fugitive co-accused at the trial against El Chapo, would have been responsible for those deposits, said lawyer Jeffrey Lichtman in his introductory plea. His client risks a life sentence. The process is expected to last four months. According to Mr Lichtman (who previously successfully defended the son of Mob boss John Gotti), drug kingpin El Chapo is nothing more than a scapegoat for the Mexican government. "Why does the Mexican government need a scapegoat? Because they make too much money from the bribes of the drug lords. " El Chapo was arrested in January 2016 in his stronghold Sinaloa, in the northwest of Mexico. Six months earlier he escaped from a high security prison via a tunnel of more than a kilometer long. Mexico later delivered the drug lord to the US.